aprile 2017 – Close up on me ! Shoes : PHEDORA – Lilly Heels – Hud with 22 colors!!! . By Celena Galli @TRES CHIC EVENTapril round! Shoes : PHEDORA – Jackie Heels – Hud with 22 colors!!! . By Celena Galli @FAMESHED april round! 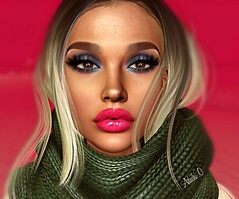 Hair : DOUX – Desi – Fades Pack . By Javiersasoo/David Cooper (dam1710) NEW!!! Hair : DOUX – Marcia – Fades Pack . By Javiersasoo/ David Cooper (dam1710) NEW!!! Shoes : KC COUTURE – Gabriella Heels – with Hud!!!. By Klari55a NEW!!! Shape : IDYLLE – Ambra Bento Shape for Lona Catwa Head. By Me Available from 7th of April @ SPOTLIGHT EVENT. Hair : DOUX – Sidium – Fades Pack . By Javiersasoo/By David Cooper (dam1710) NEW!!! Mesh Head : GENESIS – Sofie Mesh Head. By @ EPIPHANY EVENT GACHA RARE!! Head Skin Applier : GENESIS – Paola SKIN HUD @KUSTOM9 GACHA RARE!! Skin Applier : GENESIS – Tiramisu – Maitreya applier. Shape : IDYLLE – Eva Bento Shape. By Me! Piercings : Genesis_Lab_Face_Jewelry_Set – GOLD (Bento/Unrigged) @UBER March round! Hair : DOUX – Claudia – Fades Pack . By Javiersasoo NEW!!! Bra & Top & Pants : KITJA X PARKER – Tasha Bra/Top/ Shorts . By Kitja Rexie @ Kustom9 April round! • Extra colors and customizable MIX&MATCH HUD ONLY IN FATPACK! !